There are beer drinkers and there are wine drinkers and then there are just drinkers. I must raise my hand in that I fall in to the later group, although my general preference is for wine. Kicking back a Guinness at an unfortunate pub in Barcelona (yeah, I know…) the other week I thought, “Well, this is fine, but wouldn’t it be better if it had a bit of a wine thing happening in it?” Apparently someone had bugged my thoughts as carbonated genius has arrived in the form of Garnatxa Beer that we were able to taste a couple of weeks ago at the Torroja harvest festival. No, this isn’t beer made from grapes as that would be wine. What it is, is the project of a group of friends who come to the Priorat often. They all love wine (actually two of them are enologs at local wineries) but in the 40C days that can hit the Priorat villages, they often found themselves searching out cold beer instead. Personally, I’d make the switch to a cold white wine at that point, but to each their own. Wanting some way to merge the best of both worlds, they came up with this beer that’s pale ale made from the traditional hops you find in beer, but aged in French oak barrels along with the excess press juice from Grenache (in Catalan, Garnatxa) grapes from Torroja del Priorat. It’s a really wild process that they invented and initially they were just making it for themselves, but word quickly spread and they found themselves to suddenly have a full-fledged company on their hands. How does it taste? Really damned good actually. At its core, the beer is a tasty pale ale that I think would be great on its own. 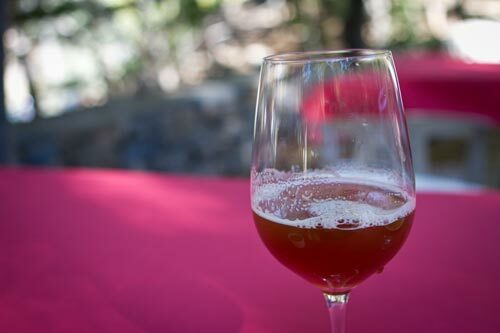 But there is this slightly sweet, slightly spicy infusion of Grenache flavors that striate the whole body and nose of a beer (yes, I just described the “nose” of a beer.) But, the beer and wine elements aren’t at odds with one another. They merge happily and make this really unique and super tasty beer that you could still have with foods or just enjoy on its own. At the same time, it’s also still very refreshing as you’d expect from a beer. It does lean a touch toward the heavier side of beers given that it has 6% alcohol, but it’s nowhere near a “barley wine“. I wish this gang great luck in the endeavor and need to remember to stock up on a couple of bottles for the fridge once back home, or maybe just one or two as it comes in 660ml bottles that are twice the size of the standard 330ml ones. I suppose the extra space was needed for their logo that seems to be the silhouette of a stripper? I saw this in a wine shop in Poble Sec last weekend and was very intrigued! I was in a wine drinking mood at the time, so didn’t go for it in the end, but will do next time for sure! Thanks for the review! Yeah, might seem like a gimmick, but it is indeed tasty.